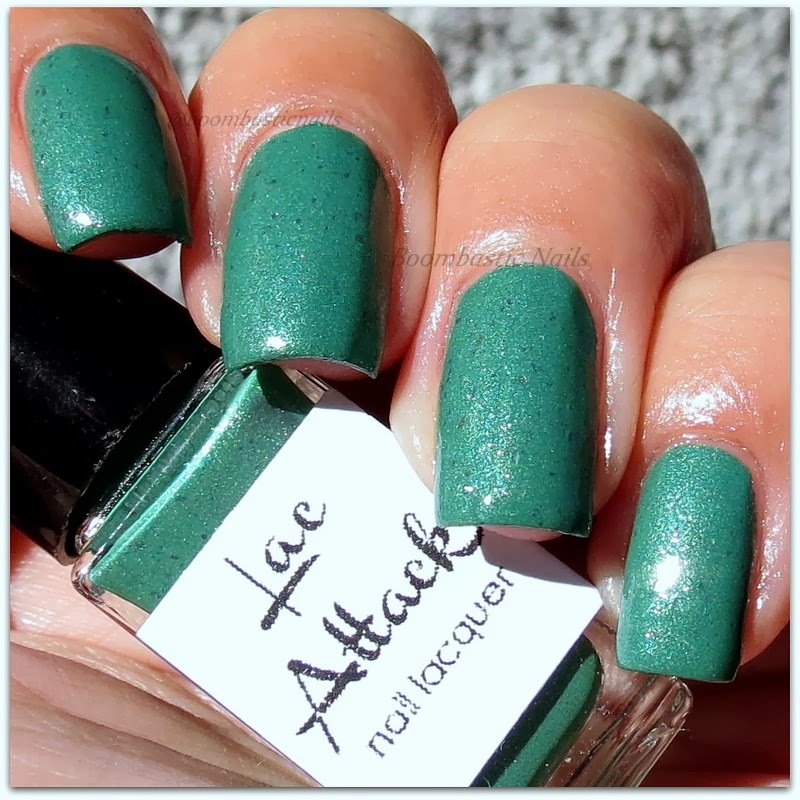 Today I have the whole entire Fall collection from Lac Attack called Cell Block Tango. It is inspired by the song of the same name from the musical Chicago; the colors are named Pop, Six, Squish, Uh-Uh, Cicero, and Lipschitz. 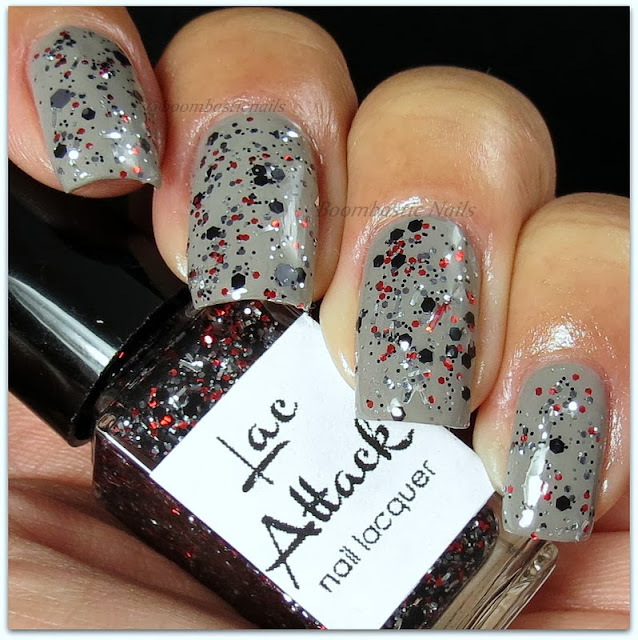 This versatile and lovely fall collection features 3 glitter topcoats and 3 shimmers! This is the entire collection at a glance. 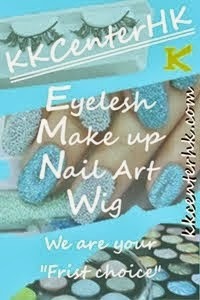 Let's start with the 3 shimmery shades. 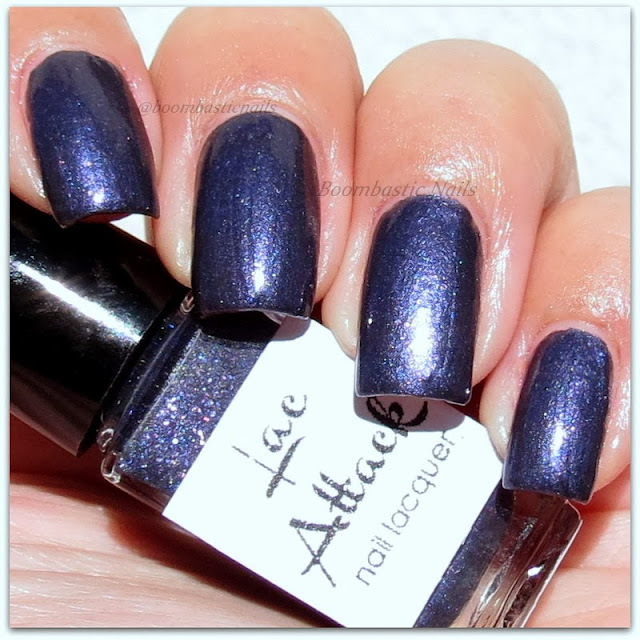 Here's 2 coats of Cicero (with 2 coats of top coat) - a very gorgeous deep purple with blue undertones (blurple?) with copper flakes. 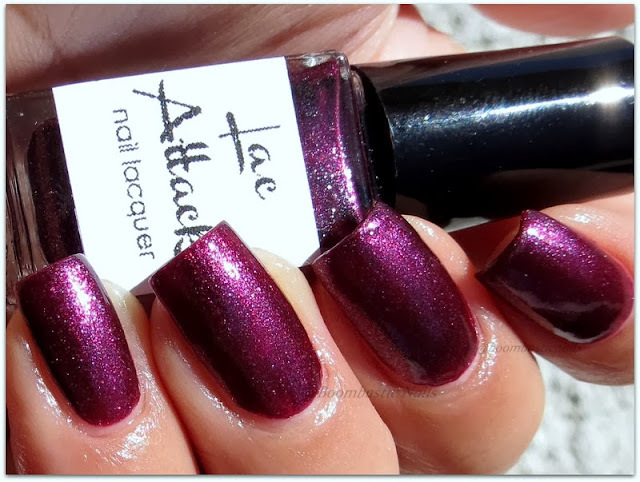 I found the formula a tad thick so I added a few drops of thinner for my right hand and it applied perfectly. This dried almost matte and it 'ate' my first coat of top coat, so that's why the second coat. This is the most matte finish of the 3 shimmery shades. Still a lovely shade!! 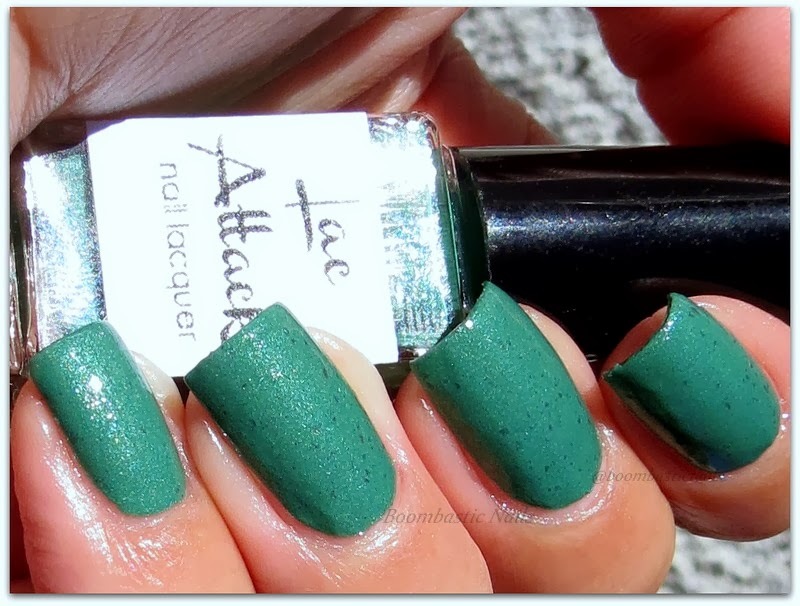 Here's 2 coats of Lipschitz - a medium green with green shimmer and tiny charcoal-colored flakes. Photos are shown with a coat of top coat. This shade is very interesting, I don't think I've ever seen such a color combo but I quite loved it. WOWZA, let me take a breath here ... This is 2 coats of Uh-Uh (with a coat of top coat) - a purple/magenta shade with shimmer. Do I HAVE to say much about this? I was sad when I had to remove this after 4 days !! I'm pretty sure this shade will be revisited very soon. 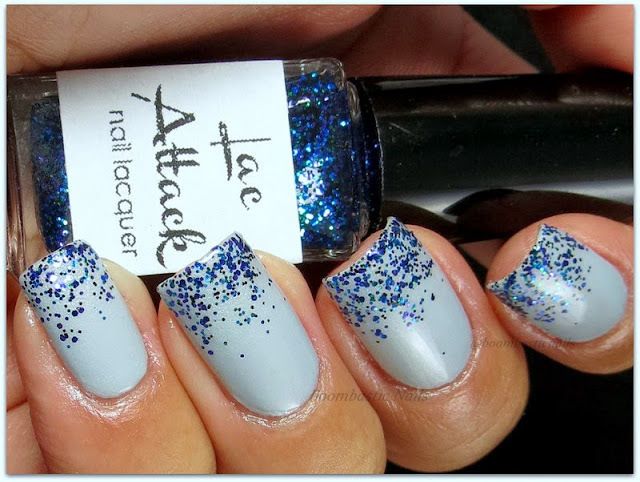 Now let's take a look at the 3 glitter top coats. Here is Pop - a clear base with pink and black round and hexes matte glitter in various sizes. 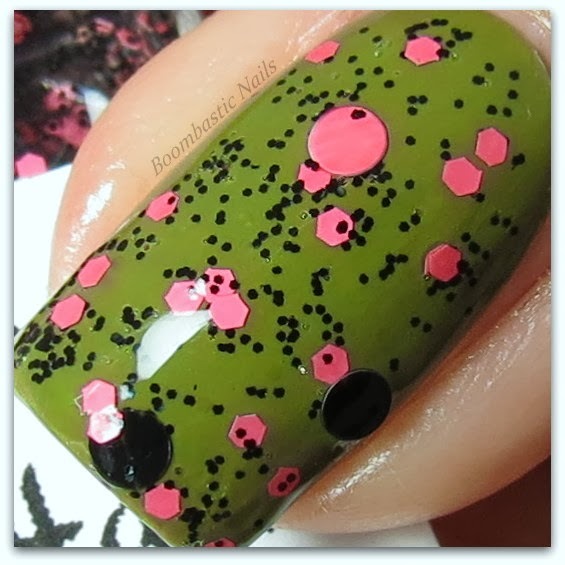 The base color is 2 coats of Dree by Zoya. Topped everything off with a coat of Gelous then top coat. 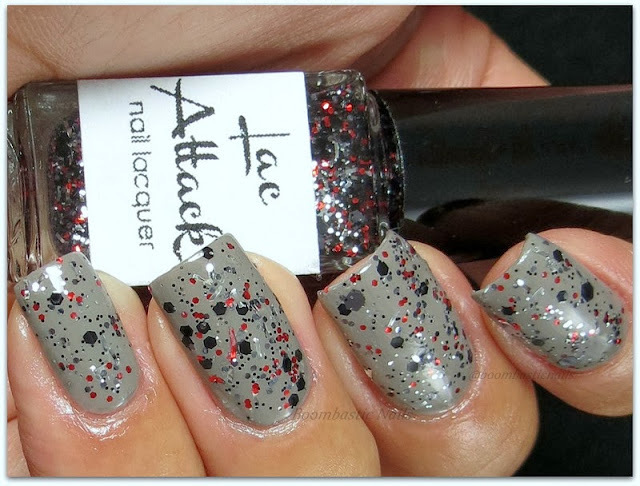 What a fun glitter top coat !! Here's Six - a clear base with six different kinds of metallic glitter in green, purple, and blue! I didn't realize there was so much going on in this until I saw the photos !! Here's Squish - a clear base with black, gunmetal silver, and red glitter in hexes and bars. I experienced some curling red bars so I emailed Anastasia right away. She was thinking to skip the red bars until she finds a replacement. Not only some of the red bars curling, some silver bars too. She's aware and I'm so sure that she's already looking for a replacement. 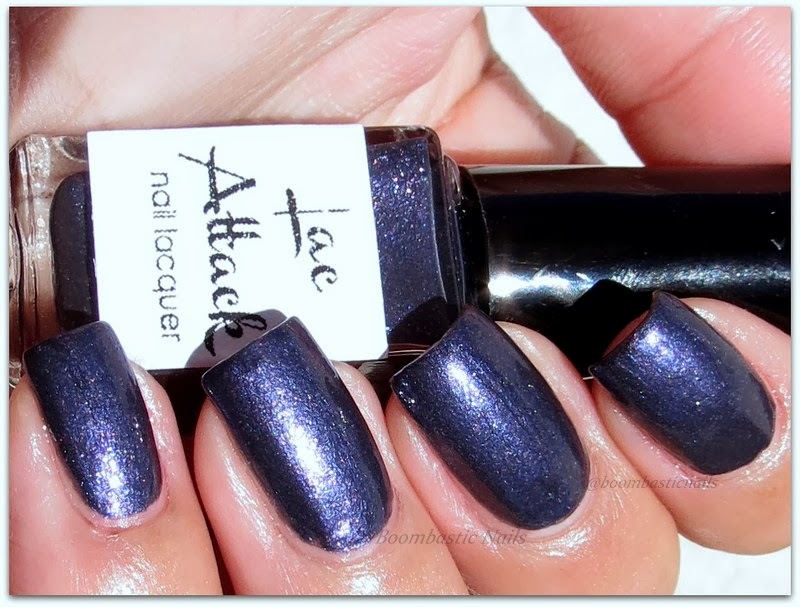 The base color is 2 coats of OPI French Quarter for your Thoughts; a coat of Gelous + top coat. I love bar glitter a lot but I know they always have the curling problem !! I really enjoyed this whole collection very much. I didn't experience any tip wear or chip with any of these. Formula was great, even with Cicero being a little thick but it was minor. 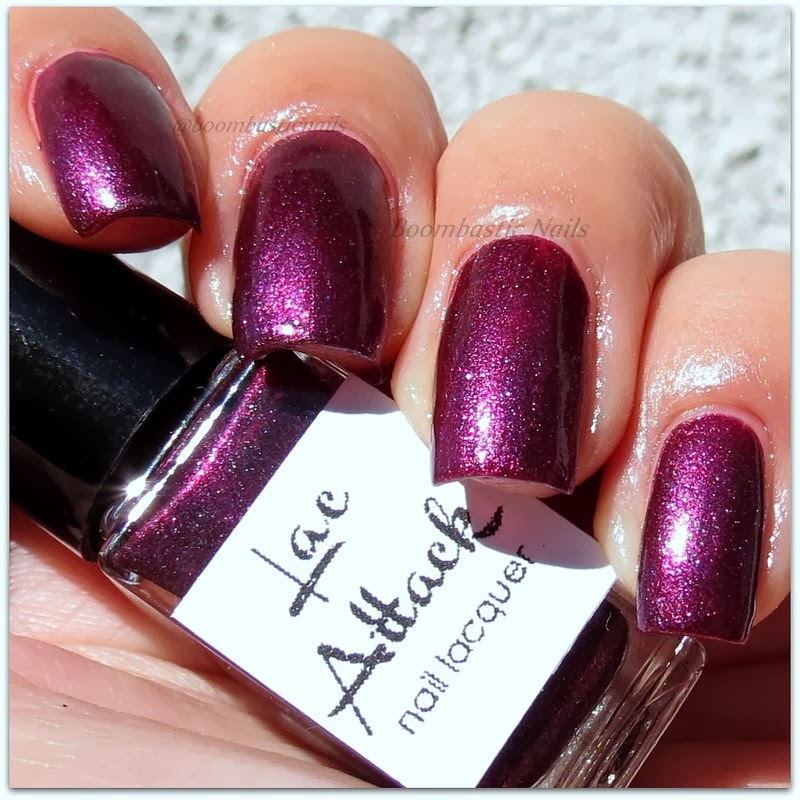 Lac Attack is available on their website, a full sized bottle for $8.50 15ml & a mini for $4.25 6ml. 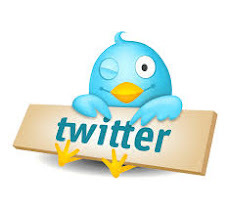 You may always find Lac Attack on Facebook, Instagram, Pinterest & Twitter to get the latest and progress. Wow!! So beautiful all of them!